We look at some of the most exciting solar projects–both existing and planned–in the country. Sunlight is the world’s most plentiful resource. That is, of course, why the United States has scrambled in recent years to supplant dirty, nonrenewable energy sources with ambitious solar projects. Below, we look at some of the most exciting solar projects–both existing and planned–in the country. Located in California’s Mojave desert, the Solar Energy Generating Systems (SEGS) plant is the largest active solar energy facility in the world. The Luz International-designed solar thermal plant has an installed capacity of 354 MW, features 936,384 parabolic mirrors and spans more than 1,600 acres. In total, SEGS provides power for 232,500 homes. The nine solar plants at the site were built between 1984 and 1990. This Boulder City, Nevada plant, completed in 2007, is the largest solar thermal plant to be built since 1991. The $266 million concentrated solar plant has a maximum capacity of 75 MW, and produces 134 million kilowatt hours of power each year. Components for the plant come from a variety of suppliers, including Siemens, Flabeg AG, Schott Solar, and Solel Solar Systems. 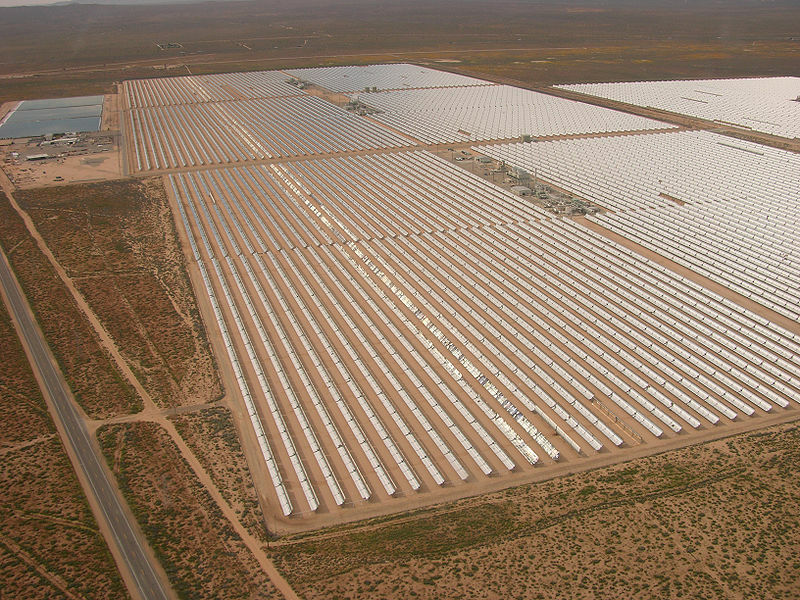 This Gila Bend, Arizona plant will have a capacity of 280 MW–enough to power 70,000 homes–when it is completed in 2013. Arizona Public Service has already contracted to buy all of the produced power from Solana’s $2 billion concentrated solar plant. The Abengoa-manufactured plant is expected to create 1,500 construction jobs and 85 full-time positions. Another mammoth Mojave desert plant, this Abengoa project was just cleared for construction last week. The plant will be built on over 1,700 acres of private land northeast of Los Angeles. When completed in 2013, the concentrated solar plant will produce 250 MW of power. Construction was approved for this NextEra-built Mojave desert project in August. This marked the first time that state energy regulators approved a solar thermal plant in 20 years. The 250 MW plant, located on 2,012 private acres in Kern County, will go into operation by the end of 2011. This 392 MW system, set to be built by Brightsource Energy, will consist of three 459-foot-tall solar towers and thousands of parabolic mirrors. The plant, which will be located in the Ivanpah Valley of Southern California, is opposed by a number of environmental groups who argue that the project will harm rare desert plants and wildlife. When completed in 2013, the system will almost double the amount of commercial solar thermal electricity produced in the U.S. If built, this proposed $6 billion solar thermal project in Blythe, California will produce a whopping 1000 MW of power, making it the largest solar power plant in the world. That’s a big “if,” though–Solar Millennium and Chevron Energy Solutions have yet to get the project approved by the California Public Utilities Commission. Update: The project was approved by the CPUC this week. The next step is to get final approval from the Bureau of Land Management. Proposed by Tessera Solar, this San Bernadino Count, California-based project could potentially produce 850 MW of concentrated solar power and cover 8,230 acres of public land. The concentrated solar project would be built in two phases–the first consisting of 11,000 Solar SunCatchers producing 275 MW, and the second consisting of 23,000 SunCatchers producing 575 MW. No word on a potential construction start date for the project, which still needs federal subsidies to move forward.